Do you have a group that you’re interested in getting instructor-led training for? 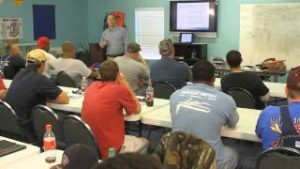 Omega Safety Training, Inc. can provide experienced health and safety trainers, to almost any location, to conduct your private group training session at very affordable rates. Fill out the request form below and one of our staff will contact you to discuss the details of your requirements. OSHA Authorized Outreach Trainers for Construction and General Industry in both Spanish and English.